Town of Ajax (Lower Tier Durham)Record Owner? Log in. Began as a shell-filling factory in 1941 when 3,000 acres (1,215 ha) of farmland were turned into a munitions plant to supply the Canadian Armed Forces. The community was named after one of three British cruisers that scuttled the German battleship Graf Spee off Montevideo, Uruguay. After the Second World War, Ajax became a temporary campus of the University of Toronto. At its peak, more than 3,300 students were enrolled in the Faculty of Applied Science and Engineering. In 1949 the university withdrew and the Central Mortgage and Housing Corporation established Canada's first fully planned community. 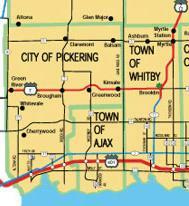 Have something to say about Town of Ajax (Lower Tier Durham)?